Memories of a dearly loved person are very precious and a 3D life cast can provide a tangible memory of your loved one. With over 17 years’ experience as a nurse (my previous profession) I offer a professional and sensitive service. I can offer casts when someone is terminally ill or after they have died. I can travel to your home, a hospice or hospital, or funeral directors. Please do get in touch to discuss the options. I am always very happy to discuss payment plans for memorial casts, if spreading the cost helps. Each cast is priced individually due to the sensitive nature and also includes a call out/ travel fee. If you would like to make a donation to help a bereaved person have a memorial cast, please donate through Paypal. The entire donated amount will go towards the cost of the casting. Review January 2019 "I had the pleasure of meeting Laura to make a memorial hand cast of my partner. Laura is lovely, so kind and understanding. She was so supportive and made the casting a truly comforting experience, nothing was too much trouble for her, I felt like I had a friend with me"
I can also make Print Jewellery of your loved ones Fingerprints or Hand/Footprints, for you to treasure and to remember them forever. I may be able take prints myself (call out fees apply). Or I can supply a print kit. I am always happy to talk the process through with you over the phone to enable you to get the best print. I can also use prints taken by hospitals/hospices or funeral director to create bespoke jewellery for you. Review Aug 2017 Today I collected my amazing beautiful jewellery from Laura. I had a pendant for a necklace, and a bead for a bracelet made, both with my late nans fingerprint embossed. I am honestly over the moon, I cannot recommend Laura enough, her customer service was brilliant, response time was excellent and even at the beginning of me placing my order, Laura went out of her way and got the prints the very next day due to my own fault of timings. I will 100% be using her services again, for castings of my dogs paws and future children's hands and feet. The pieces of jewellery that she's made, I will keep for the rest of my life, and I am so pleased with all the tiny detail and the quality- I feel now as though Nans even closer, funny what jewlery that's personalised can do! Thank you so much Laura, I will be singing your praises to everyone. Very happy customer ! Beth Rose (July 24th 2002 - March 10th 2016) very sadly died suddenly in the spring of 2016. 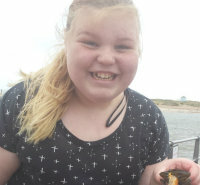 Beth was a wonderful, very popular 13 year old teenager who enjoyed school. She came from a large family and is greatly missed by her parents, brothers and sisters. Her devastated parents asked me to take casts of Beth's hands at the Funeral Directors. They now have this lovely cast to remember her forever. I also took finger prints at the Funeral Directors and I made beautiful silver rings for her mum and dad to wear. Baby Kaleb, very sadly died very soon after he was born a couple of years ago. At the time the staff at the hospital took prints of his feet as a memory for his parents. These prints were put away safely until Kaleb's mum felt ready to discuss a keepsake in Kaleb's memory. She visited me at Laura's Treasured Prints a few weeks ago to discuss a silver keepsake pendant. She choose a silver star, as she tells her other children that Kaleb is looking down from the stars. The star has Kaleb's little footprint on it. A lovely keepsake she can wear in his memory. "Every night before I go to bed I blow out the candle on the mantle piece and hold my little girls hand again" Quote from Phoebe's mum, Vicki. In September this year I met a little girl called Phoebe and her mum, Vicki. Phoebe had been diagnosed with AML Leukaemia in 2012. 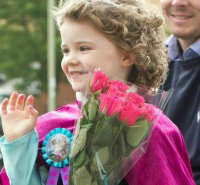 After a lot of treatment, very sadly in August 2015 her family were told that Phoebe was now terminally ill.
Devastated by the news Phoebe's parents decided that they wanted Phoebe's last months to be filled with fun memories for the whole family. They went on a seaside holiday, went to Centre Parcs with Phoebe's cousins and visited London to see a show. They also celebrated an amazing 5th birthday party for Phoebe. I was honoured to be asked to make a hand holding cast and print Jewellery for Phoebe's mum and other family members. Phoebe told me about her party while I took moulds of her fingerprints, which is a bit like playing with Play Doh. Phoebe wasn't so keen on having the holding cast but we managed to get a lovely cast of Phoebe holding hands with her mum, with the help of Kitkat! Later that week I met Phoebe's Grandma Dawn. She talked so fondly of little Phoebe, telling me how she would sing the rhyme- round and round the garden, like a Teddy Bear to Phoebe. She took some hand print kits for Phoebe and her brother Oliver, to have fun at home taking their prints. The children also drew pictures and Phoebe made Dawn pose for a drawing! I was later able to incorporate Phoebe's lovely drawing of Grandma Dawn into the jewellery and keepsakes that Dawn chose. I was so sad to hear that Phoebe passed away on 30/10/15. Vicki visited me soon afterwards to discuss some print jewellery. I was so touched to hear Vicki say how comforting she found having the cast of Phoebe's little hand. "Every night before I go to bed I blow out the candle on the mantle piece and hold my little girls hand again"
Gift Vouchers- the great gift!